Learn How to Make Your First Draft Easy! Award-winning author K.M. Weiland’s previous book, the acclaimed Outlining Your Novel, showed writers how to embrace outlines in a way that makes the writing process fun, inspiring, and easy. Now it’s time to put those lessons to use! Building upon the principles you’ve already learned, the Outlining Your Novel Workbook presents a guided approach to getting the bones of your story down on paper, identifying plot holes, and brainstorming exciting new possibilities. 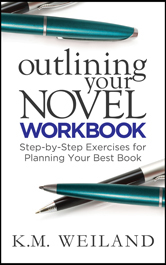 This accessible and streamlined workbook will empower you to create a powerful outline—and an outstanding novel. Start writing your best book today! Want to order in bulk? "Whether you like the organized or the intuitive approach or some blend of both, you’ll find a wealth of advice in K. M. Weiland’s Outlining Your Novel: Map Your Way to Success (2011) and its invaluable companion Outlining Your Novel Workbook: Step-by-Step Exercises for Planning Your Best Book (2014)." "I have finished the outlining stage of my book! Many thanks to K.M. Weiland and her Outlining Your Novel Workbook!" "I'm on FIRE this weekend thanks to K.M. Weiland's workbook/book combo Outlining Your Novel. Check it out!" Announcing My Latest Novel: Wayfarer!